Alright, this is the third and last time you'll be doing these exercises, so give it all you've got! Next week, you'll get a brand new batch of cool stuff. For today's workout, instead of performing a maximum numbers of reps in a specific time, you're going to do a specific number of reps in minimum time. For each exercise, add your score from Day 21 with your score from Day 24 and multiply the result by 3. That's your reps goal for today. You can do your exercises in any order, jump from one to the other at any time and take rests whenever you want. Your mission is to complete all your exercises as fast as possible. Kudos if you can make it in under 16 minutes. If you are logged in to your facebook account, this page has already calculated your goals for today and you can see your numbers on the top right corner. If not, you can still calculate it manually. Just enter your goals (if they're not already there) and the time it took you to finish the workout at the top right corner of this page. Click on "Post your results" to record your score, this will post your numbers on your wall. You can hide them from your friends if you want, but I encourage you to share your numbers as a motivator. Much like the cliff scalers, this is an advanced push-up exercise. But instead of stepping sideways in between push-ups, you‘ll be stepping forward and backward as you perform the push-ups. Get yourself into push-up position and take a step forward by advancing your right hand and your right leg. Now bring your left hand and your left leg forward to complete the second step. Keep going until you‘ve taken 8 steps or you‘ve run out of room. Then, do the same thing backwards to get back to your starting position. Keep your core tight and your back straight. Don‘t wuss out on the movement, bend your elbows at least 90 degrees every time. Inhale when you go down, exhale when you come up. Score it like standard push-ups. Find a wall and put your back to it. Set yourself in a plank position with your hands on the floor and your feet on the wall. Keep your arms straight. Your body should be parallel to the floor. This is your starting position. Now walk back with your hands and feet until your body is almost vertical against the floor. Don‘t go too far or you‘ll lose your balance. Keep your body straight the whole time. Walk back down until your body is horizontal again. Breathe regularly. Add a score of 1 every time you perform a full cycle. Alternative: If you find the move too hard, simply put yourself in a handstand and hold the position for as long as possible. Score it like a plank. Face a chair and sit down on the floor. Lay your back on the floor and put your feet on the base of the chair with your knees at 90 degrees. While keeping your left foot on the chair, lift your right foot in the air so that your left leg is straight. This is your starting position. Now raise your bottom until your leg and torso form a straight line. Come back down to finish the move. Alternate legs on the next round. Score every cycle. Stand up straight with your feet a little more than shoulder-width apart. 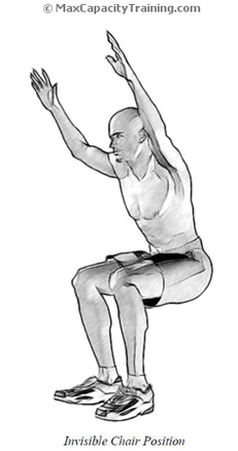 Raise your hands up in the air and slowly lower your body until your knees are at a 90 degree angle. Keep your chest up and look straight ahead. You should give the illusion that you are sitting on an invisible chair. Your score is based on how long you can stay in the position with good form. Save time by resting less, not by going too fast!